This article applies to Microsoft Dynamics AX for all regions. This article describes that an update is available for Help server content for Microsoft Dynamics AX 2012. This update contains additional help content in localized languages. This update enables you to add translated documentation if you are using Microsoft Dynamics AX in a language that differs from English. Additional content is available in United States English on TechNet. An update to Help server content for Microsoft Dynamics AX 2012 R2 in US English is also available. This content is available only for United States English. This update contains the most current content available for installation on your Help server. In special cases, charges that are ordinarily incurred for support calls may be canceled if a Technical Support Professional for Microsoft Dynamics and related products determines that a specific update will resolve your problem. The usual support costs will apply to any additional support questions and issues that do not qualify for the specific update in question. Save and unpack the hotfix file for the language that you are installing. Note When you unpack the hotfix file, each .zip file produces a DynamicsAX2012-KB2585394-language code.msi file. For example, a .zip file produces a DynamicsAX2012-KB2585394-DA.msi file. On the Microsoft Dynamics AX 2012 Help server, click Start, click Control Panel, and then click Uninstall a program. If an .msi file for a language that you want to update is included in the list of program, uninstall it. 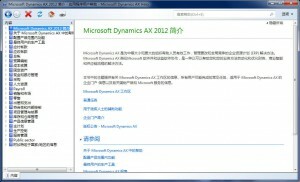 For example, uninstall Microsoft Dynamics AX 2012 Help Content (DA) if you want to use the DynamicsAX2012-KB2585394-DA.msi file. If the language you are using is not listed, skip to step 7. Verify that the Microsoft Dynamics AX DVD image is copied to a network location. Note The Uninstall a program process does not remove the .msi files. The name of the folder must match the abbreviation of the language, or the language-region combination, that is used in the name of the .msi file. For example, if you’re installing French for use in Canada, the folder must be named fr-CA. From the Help server, run the Setup.exe file from the root of the CD folder. Note If you have not installed the Help server, use the installation instructions to install the Help server. The content for the languages that you select will be installed when you install the Help server. Click Install, and then select Microsoft Dynamics AX components. Click Add or modify components, and then click Next. Select the Help Server component, and then click Next. Select the Help content to install. For example, if you want to install the DynamicsAX2012-KB2585394-DA.msi file, click Danish. Then, click Next. You must have Microsoft Dynamics AX 2012 R2 or Microsoft Dynamics AX 2012 installed to apply this hotfix. Translated Help server content for the Microsoft Dynamics AX 2012 Feature Pack is available. To validate the installation, open Microsoft Dynamics AX, and then open the help content. Make sure that the Language field and the Alt Help Language field in the Set up general user options dialog box (click File, click Tools, and then click Options) are set to the language in which the help content is displayed. If you change the value in the Language field and in the Alt Help Language field, you must restart Microsoft Dynamics AX. Then, the change will take effect.